Once again, Gary and I were front row center (don't think we don't appreciate this -- we really do) -- this time courtesy of Tom Petty's always philanthropic attitude that brought us the great opportunity to donate to the June 2008 Midwestern flood victims. It always makes for a better show when your grand night out benefits someone other than just yourselves. We were not disappointed; the money spent was well worth it! Maybe it was the warm late summer night vs. the June gloom, or maybe it was just the buzz in the air (or the "buzz" of this Irvine crowd), but this show was electric ... perhaps, the best we've seen Petty and his boys ... ever! 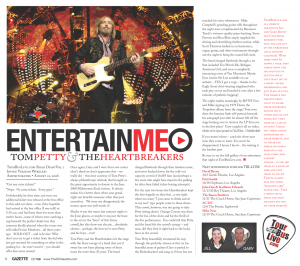 Tom Petty and the Heartbreakers hit the stage with the fierce energy of a band that you'd swear has not been playing some of these tunes for more than 30 years. The band charged flawlessly through their timeless music, and never backed down, for the sold-out capacity crowd of 16,085 fans (and perhaps a few more who might have stayed in the parking lot after their failed ticket-buying attempts). For the next two hours the Heartbreakers kept the fans happily on their seat ... a rare sight when too many "I just came to drink and sit in my seat" type people come to these shows. This crowd, however, was not going to take Petty sitting down! Orange County was there for the fun of the show and the thrill of the live performance. You could tell that Petty and the band felt the crowd's energy -- and man, did they feed it right back to the lucky faces in the crowd. 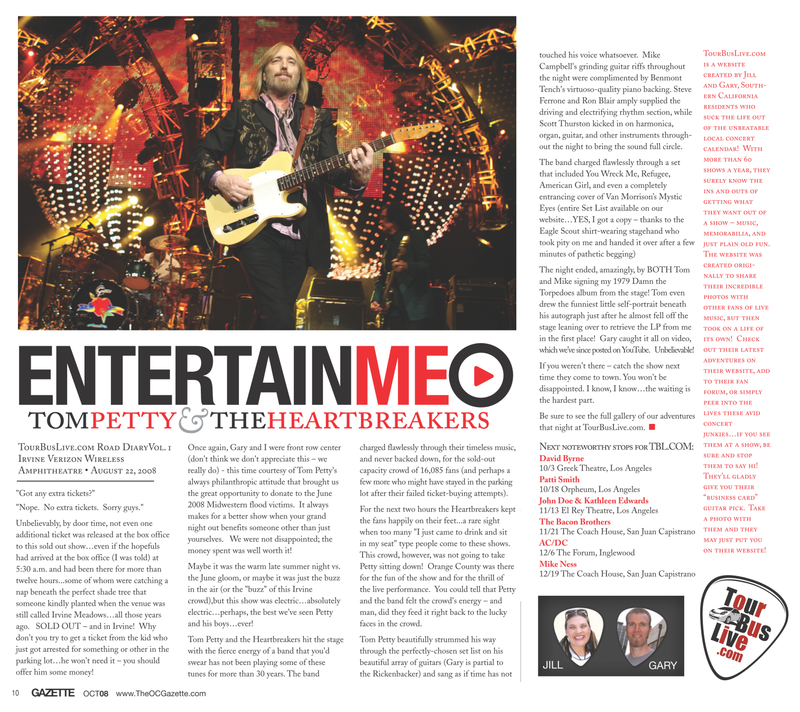 Tom Petty beautifully strummed his way through the perfectly-chosen set list on his beautiful array of guitars (Gary is partial to the Rickenbacker) and sang as if time has not touched his voice whatsoever; Mike Campbell's grinding guitar riffs throughout the night were complimented by Benmont Tench's virtuoso-quality piano backing. Steve Ferrone and Ron Blair amply supplied the driving and electrifying rhythm section, while Scott Thurston kicked in on harmonica, organ, guitar and other instruments throughout the night to bring the sound full circle. The band charged flawlessly through a set that included You Wreck Me, Refugee, American Girl, and even a completely entrancing cover of Van Morrison's Mystic Eyes (entire Set List available on our website ... YES< I got a copy -- thanks to the Eagle Scout shirt-wearing stagehand who took pity on me and handed it over after a few minutes of pathetic begging). The night ended, amazingly, by BOTH Tom and Mike signing my 1979 Damn the Torpedoes album from the stage! Tom even drew the funniest little self-portrait beneath his autograph just after he almost fell of the stage leaning over to retrieve the LP from me in the first place! Gary caught it all on video, which we've since posted on YouTube. Unbelievable! If you weren't there -- catch the show next time they come to town. You won't be disappointed. I know, I know ... the waiting is the hardest part. Be sure to see the full gallery of our adventures that night at TourBusLive.com.